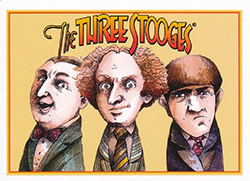 Join Beckett non-sports and gaming analyst Matt Bible and Eric Norton as they open 2014 Chronicles of the Three Stooges Series 1 from RRParks. Larry gets my vote…great hair! I believe it’s universally accepted that Curly is the best Stooge. I can talk just like Curly, so he has a special place in my Stooge heart! i always had a special place in my heart for shemp! he truly was the actor of the bunch! Gonna buck the trend. Moe. See the Deer, does she have any doe? curly. i loved watching this show with my dad as a kid. It has to be Curly. He doesn’t take everything so seriously and doesn’t have to worry about always getting pie in his hair. Since in my opinion, Fun House is the greatest rock album ever made, I am tempted to say Iggy Pop. MY FAVORITE STOOGE HAS ALWAYS BEEN SHEMP! By far, it’s the great Curly! Nyuk nyuk nyuk! Gonna have to be then follower Curly … He’s always the last one in everything.. Clueless and is the original Rodney Dangerfield ..! ???? It’s gotta be Curley!!! No one takes a beating and keeps on ticking like Curley did!! He was a true 1 of 1!! Without a doubt it has to be Curly. Curly is my favorite stooge,funny as hell. A winner will be chosen tomorrow, 4/20. I’d hate to think this contest was overseen by the law firm of Dewey, Cheatem and Howe?? Gnuk gnuk gnuk gnul gnuk gnuk gnuk!